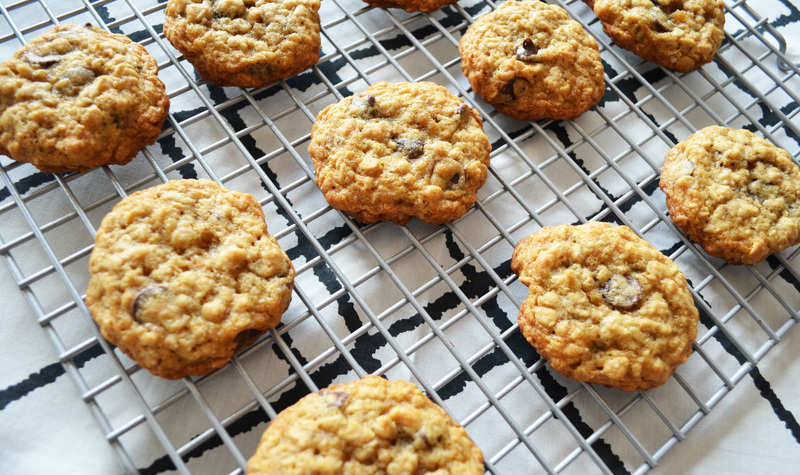 Who Doesn’t love Oatmeal Chocolate Chip Cookies?! I can not help myself, every time I think of cookies I remember the Cookie Monster reciting those famous words “Mmmmm Cooookiies” in that famous Cookie Monster voice. While chewing on them like crazy as he throws the cookie everywhere in the air because he cant really eat them. This shows us again how strong the connection between food and child hood memories can be. That monster eating memory and my love for cookies is never going to fade. Saying that I love chocolate chip cookies is an understatement, but when I want to change it up making these oatmeal chocolate chip cookies keeps that classic chocolate chip taste while adding extra chewiness. Extra chews means a longer lasting cookie which just excites me even more. This doesn’t help me to eat less cookies, but it makes the moments indulging in this delicious dessert last a couple extra minutes.